Whitewater residents’ petition seeking help to get rid of the sickening stench of Alanco’s frackwater pits. Whitewater residents are begging other Mesa County residents to help them, and boy, do they need our help. Imagine you’ve bought some peaceful acreage in the outskirts of Mesa County. You finally realize your dream of owning your own land. You build a house, move in and start enjoying the beauty, quiet, views and proximity to wildlife that the area offers. Then one day, a stench akin to metallic excrement wafts over your house. It’s doesn’t just stay for a minute. It’s not there for just an hour. It’s permanent. The stench is so strong it forces your family indoors on nice summer evenings. You have to close all your doors and windows in midsummer to try to escape it. Then your family starts getting sore throats and headaches. Your kids start having nosebleeds and vomiting. You contact local and state authorities for help, to no avail. Whatever you do — no matter how many letters you write, phone calls you make or public hearings you go to — nothing changes. Welcome to the world of Whitewater residents living within smelling distance of Alanco Energy’s Deer Creek frackwater evaporation ponds. In 2012, the County Commissioners approved construction of Alanco’s hazardous waste disposal facility in the Whitewater area. It now accepts contaminated water from fracked wells 24/7 for hundreds of miles around. The facility evaporates the contaminated water into the air to get rid of it, but it’s also Whitewater residents’ air. People who live downwind are forced to breathe everything Alanco’s evaporation pits are pumping into the air, and it’s making them sick. Whitewater residents have been struggling to get a stop put to the harmful stench since 2013. They’ve begged Alanco Energy Services, their elected officials and health and environmental agencies from Denver to Grand Junction for help for years, all to no avail. No person and no agency has helped them. They’ve been helpless to fight the problem and continue to breathe the contaminated air around their homes and get sick. Now they are warning other Mesa County residents that they could be next if the Commissioners keep approving this type of industrial hazardous waste development in Mesa County. 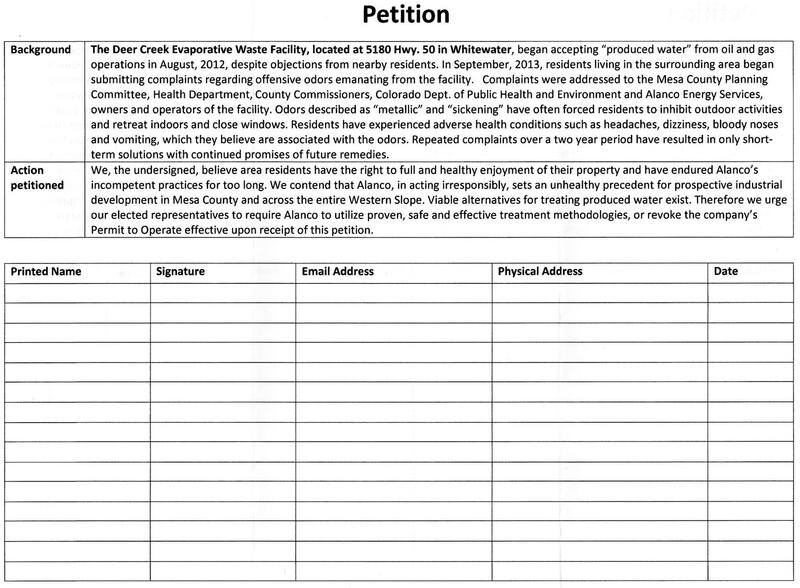 They’re also asking their fellow Mesa County residents for help by signing petitions demanding commissioners either end their hell once and for all, or shut down Alanco’s hazardous stink pits. Background: The Deer Creek Evaporative Waste Facility located at 5180 Highway 50 in Whitewater, began accepting “produced water” from oil and gas operations in August, 2012, despite objections from nearby residents. In September, 2013, residents living in the surrounding area began submitting complaints regarding offensive odors emanating from the facility. Complaints were addressed to the Mesa County Planning Committee, Health Department, County Commissioners, Colorado Department of Public Health and Environment and Alanco Energy Services, owners and operators of the facility. Odors described as “metallic” and “sickening”have often forced residents to inhibit outdoor activities and retreat indoors and close windows. Residents have experienced adverse health conditions such as headaches, dizziness, bloody noses and vomiting, which they believe are associated with the odors. Repeated complaints over a two year period have resulted in only short-term solutions with continued promise of future remedies. The Deer Creek frackwater disposal facility and Whitewater residents’ plight is a lesson, and a red flag to all of us. All Mesa County residents (other than the commissioners themselves, of course) currently run the risk of having a hazardous waste facility approved close enough to your homes to impact your health, quality of life and property value. If the county commissioners green light more facilities like Alanco’s hazardous stink pits and then refuse to remedy the problems these facilities cause the way they’ve failed to do in Whitewater, the rest of us run the risk of the same kind of treatment. The way the current Mesa County Commissioners revere oil and gas development, it’s a likely scenario. It’s time for all Mesa County residents to help our Whitewater neighbors regain their health, environment and property values, and help protect ourselves from getting overrun by dangerous industrial development. You can do it by signing and circulating the petition, and showing the commissioners we all care about this disastrous situation. To download, print and sign Whitewater residents’ petition to the Mesa County Commissioners, click here. We are neighbors in Delta County. Is it helpful to have signers from here? Air quality does not stop with county borders. Someone please let me know if it is worth while to have Delta Co. residents weigh in. Sure, Phyllis. We can use all the help we can get. Print out the petition and start circulating! When it’s full, send it to the Mesa County Commissioners! Thanks for your concern! Delta County residents should, indeed, be concerned. Our Mesa County Commissioners will be presented with petitions sometime in early November. As someone who has been working with residents for over a year now, I have a request: would you please send or deliver your signatures to either myself or one of the residents instead of commissioners? We’d like to hold them, count them, and present all together to hopefully have an impact! Please email the address above and I’ll give you more information on where to send! Many thanks again for your help. Thanks for sharing our story, Anne Landman.